Work to replace bridge joints along the M6 Thelwall Viaduct in Cheshire is nearing completion and traffic management will be removed from the two bridges by the middle of next week – requiring full carriageway closures on Sunday and Wednesday nights. The work was due to be completed last Friday (9 May) but replacing the southbound bridge joints took longer than anticipated due to extra concrete repairs. Work on the northbound carriageway has been completed more quickly than anticipated – allowing a contraflow lane, 40mph speed restriction and narrow lanes to be removed before next week’s bank holiday weekend. Joint replacement work is still required on the northbound exit slip road at junction 21 which will take the project into June but this will be limited to occasional ovenight lane and slip road closures at weekends. To allow removal of the contraflow and other traffic management measures, a full overnight closure of the northbound carriageway will take place on Sunday (18 May) and the southbound carriageway will be closed overnight on Wednesday night (21 May). The closures will take place between 10pm and 5am on the nights in question with the northbound carriageway closed between junction 20 and junction 21 on Sunday and the southbound carriageway closed between junction 21A and junction 20 on Wednesday night. On both nights, clearly-signed diversions will be in place. The dedicated project page is on the Highways Agency’s website http://www.highways.gov.uk/roads/road-projects/m6-thelwall-viaduct. It includes advice and tips for planning and managing journeys during the project. 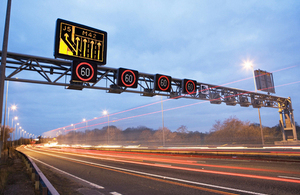 Scheme and live traffic information is also available from the Highways Agency’s Information Line at 0300 123 5000.